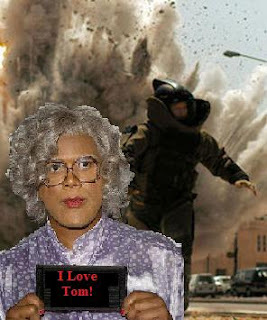 Cam's Cinematic Episodes: Epi-Cast: Episode 15 - "(500) Days in Madea's Hurt Locker"
Epi-Cast: Episode 15 - "(500) Days in Madea's Hurt Locker"
Well, summer is quickly closing its hallowed doors for the year, and Cam and Tom have gathered once again to pay homage to its late season movie offerings. Sure they could be at the beach! Or washing cars in minimal clothing while giddily whipping their heads around to Len's "Steal My Sunshine"... But they aren't damnit! They're sacrificing for you, ensuring another eight months of pasty skin, cranking out another 90 minutes of film-related pod-casting content for you to listen to while you're out suntanning and eyeing the chippies/himbos. You're most welcome. In this unintentionally dirty-sounding episode the doofy duo take part in a combustible review of Kathryn Bigelow's excellent Iraq action-flick The Hurt Locker. In addition, Cam critiques the happy-happy-joy-joy wonderful (500) Days of Summer, Judd Apatow's newest "joint" Funny People and, in a later recorded addition, the Olyphant-tastic, but otherwise clunky, A Perfect Getaway. That said, though, the real pyrotechnics go off when Tom, for reasons beyond all reason and comprehension, delivers his thoughts on sitting through Tyler Perry's Madea Goes to Jail. Seriously. The two also, in their "Trailer Park Encounters" segment spew out their thoughts about the hot new trailers for the Wes Anderson-directed Roald Dahl adaptation Fantastic Mr. Fox, the Wachowski Brother's Ninja Assassin, the Coen Brother's A Serious Man and Peter Jackson's probable Oscar-winner The Lovely Bones. Enjoy or die. You can do no less. To download, simply right-click and save on the green episode title above. Then you are free to cringe/enjoy to your wuverly heart's delight. P.S. We are also available on iTunes! No guff! Simply do a store search for "Epi-Cast" and, CHASTITY-BONO!, you can subscribe to our feed and receive insta-downloads. It's better than the Nintendo Power Glove! Oh, and we are the film discussion show, not the Christian show.